The Western world and that part of the world that partakes of Western explanations live in a fictional world. We see this everywhere we look -- in the alleged machinations of Russia to elect Donald Trump president of the US, in claims that Saddam Hussein and his (nonexistent) weapons of mass destruction were a threat to the United States (a mushroom cloud over American cities), that Assad of Syria used chemical weapons against his own people, that Iran has a nuclear weapons program, that a few Saudi Arabians outwitted the entirety of the US, EU, and Israeli intelligence services and delivered the greatest humiliation to the "world's only superpower" in the history of mankind, that Russia invaded Ukraine and could at any moment invade the Baltics and Poland, that the US rate of unemployment is 4.6%, that China's trade surplus with the US is due to Chinese currency manipulation, and so on and on. Allegedly we live in a scientific era of information, but what good can come from faulty orchestrated information? As long as fake news delivered by presstitutes serves powerful private and governmental interests, how can we know the truth about anything? For example, consider the claim found everywhere in US government and US media statements that the massive US trade deficit with China is the result of Chinese currency manipulation, keeping the yuan underpriced relative to the US dollar. This false claim, which is widely accepted as truth even by Russian writers on Russian websites, is nonsense. China's currency is pegged to the US dollar. It moves with the dollar. China pegged its currency to the US dollar in order to create confidence in the Chinese currency. Over the past decade China has adjusted the peg of its currency to the dollar and permitted a rise in the value of the Chinese currency from 8.1 yuan to 6.9 yuan to the US dollar. (The yuan reached a strength of 6 to the dollar, but a rising dollar was pulling up the yuan, causing China to widen the float in order to avoid undue appreciation because of the US dollar's rise to other Asian and European currencies.) How is a rising yuan "currency manipulation"? Don't expect an answer from the presstitute financial media or the junk economists who comprise the neoliberal economics profession. The function of the myth of Chinese currency manipulation is to hide from view the fact that the massive US trade deficit with China is due to US corporations offshoring their production for US markets to China. When US corporations bring goods and services produced offshore back to the US for sale, they enter as imports, thus swelling the trade deficit. 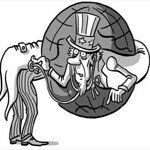 The myth about currency manipulation shifts the blame from US corporations to China, while in fact it is the return of off-shored production, such as Apple computers, for sale to Americans that swells the US trade deficit. US corporations produce offshore because the much lower labor costs result in higher profits, higher stock prices for shareholders, and in performance bonuses for executives. One of the main causes for the high Dow Jones averages and the worsened income and wealth distribution in the US is the offshoring of jobs. In 2016 the richest people added $237 billion to their wealth, while the rise in student loan, auto loan, and credit card debt combined with stagnant or declining income left ordinary Americans poorer. During the 21st century, household indebtedness has risen from about 70% of GDP to about 80%. Personal income has not risen in keeping with personal debt. The offshoring of jobs benefits only a small number of shareholders and executives, and it imposes massive external costs on American society. Former prosperous manufacturing states are in long term depression. Median real family incomes have fallen. Real estate values in abandoned manufacturing areas have fallen. The tax base has eroded. State and local government pension systems cannot meet their obligations. The social safety net is unraveling. To get an idea of the external costs that offshoring imposes on the American population, go online and look at the pictures of decrepit Detroit, formerly an industrial powerhouse. Schools and libraries are abandoned. Public buildings are abandoned. Factories are abandoned. Homes are abandoned. Churches are abandoned. Here is one four-minute video. And it is not only Detroit. In my book, The Failure of Laissez Faire Capitalism (Clarity Press, 2013), I report the 2010 US Census data. The population of Detroit, formerly America's fourth largest city, declined by 25 percent in the first decade of the 21st century. Gary, Indiana, lost 22 percent of its population. Flint, Michigan, lost 18 percent. Cleveland, Ohio lost 17 percent. Pittsburg, Pennsylvania lost 7 percent. South Bend lost 6 percent. Rochester, New York, lost 4 percent. St. Louis, Missouri, lost 20 percent. these cities were once the home of American manufacturing and industrial might. Instead of telling the truth, the presstitute financial media and the corrupt US economics profession have hidden the massive social and external costs of jobs offshoring under the totally false claim that offshoring is good for the economy. In my book, I take to task corporate shills such as Dartmouth's Matthew Slaughter and Harvard's Michael Porter, who produced through incompetence or complicity erroneous reports of the great benefits to Americans of having their jobs given to Chinese and American cities left in ruins. Throughout its history the US has suffered from public lies, but not until the Clinton, George W. Bush, and Obama regimes did lies become so ubiquitous that truth disappeared. Consider the November jobs report. We were told that the unemployment rate has fallen to 4.6% and that 178,000 new US jobs were created in November. The recovery is on course, etc. But what are the real facts?